Twenty one years is a long time. Reaching that milestone can seem to take an eternity when you’re a teenager anxiously waiting to get to college and legally grab a drink at the bar. Doing the same job for that amount of time I imagine could become tedious as well, even if it’s something you love like being in a rock band. Compounding that struggle would be if you’re making music, but not selling a lot of albums. Today’s band hasn’t let that struggle deter them, and they’re still going strong. In 1995 three guys in Austin, Texas started a band called Big Car. It was mostly a hobby, so band members came and went – various new band names were thought of, but it was just some guys having a good time. Taking it out of the garage and into the local music scene in Austin, they determined they needed to finally pick a name and stick with it. 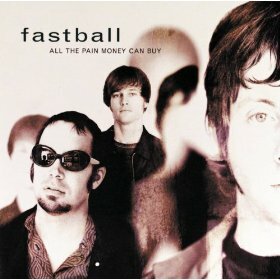 Out of all 10+ band names they’d used in the past, Fastball was the one that stuck. The local buzz about the band was strong so a local journalist went to see them play and found what he thought was a gem. That writer had a connection to an exec at Hollywood Records and soon Fastball had a contract. They released their debut album in 1996, but it failed to achieve much success. Although Fastball was named “Best Pop Band” at the Austin Music Awards, that’s little of a savior to your label when your first album sells only 6,500 copies. In spite of the poor performance, the record label stuck with Fastball and advised them to work on new material. Each of the guys had been working side jobs to make ends meet, so they decided to stop and devote all their time to music. That dedication showed their agent they were serious, so in turn he worked to get them two performances: one on The Tonight Show and the other on Late Night with Conan O’Brien. These coincided with the release of their sophomore album All The Pain Money Can Buy which debuted in March of 1998. Immediately the label knew they had a chart topping single in a track called “The Way” which was a top five hit on the Billboard Top 40. Two other tracks would become certified singles, with “Out Of My Head” also reaching the top ten. Fast forward to today and the album is certified platinum with nearly 3 million copies sold worldwide. This album is fun—it’s not going to change your life, but it’s a good listen. It’s poppy, folky with a hint of alt rock. Fastball hasn’t had an album be certified since this one, and I suspect part of that reason might be because they never found a real identity as a band. I’ve never heard their follow ups, but maybe I’ll check them out later this week. In the meantime, celebrate a band that has been grinding away for over two decades and hasn’t given up. Five bucks for a solid album might keep the lead singer from going back to the graveyard shift at a bagel factory.